Tanzanite is a blue-purple gemstone found in Tanzania, in the Mererani Hills near the city of Arusha and Mount Kilimanjaro. It is named after the country of Tanzania, where it is found. It is a kind of a mineral called zoisite. 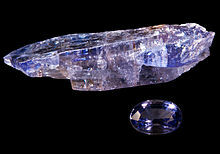 When it is first mined, tanzanite is usually a red-brown colour. It needs to be heated to 600 degrees Celsius in a special oven to bring out its purple colour. This page was last changed on 9 November 2013, at 05:07.